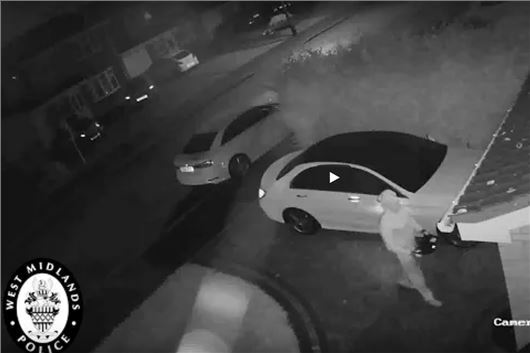 Police have released footage of a car theft in the West Midlands that shows thieves speeding off in Mercedes-Benz after boosting the key's signal from within the owner's home. The video shows two men, both carrying relay boxes, pulling up outside the victim's home. These devices work in pairs, with one transmitter near the key fob and the other near the vehicle. Essentially, these devices trick your car into thinking the key is close. The radio connection between the key and the car can easily be extended over 100 metres, regardless of whether the original key is at home or in the pocket of the owner. In theory, keyless entry is a useful extra. No more faffing about trying to get your keys from you pocket - instead the car simply unlocks itself when you're close enough. But, as this video shows, keyless entry also makes cars more vunerable to theives. Anyone, with the help of a relay box, can boost the signal from the keyfob inside your house and be off with your car in under a minute. The gadgets are available online, though anyone with the right knowledge can build one for less than £100. Experts say gangs are stealing cars to order and often breaking them up into parts. Once the vehicles are out of range of the keyfob, it's difficult to restart the engines. So, the cars are commonly driven straight into containers and shipped out of the country. But here's the good news, there's a couple of ways to counteract these thefts. The devices are capable of receiving signals through walls, doors and windows - but not metal. So, drivers can stop cars being stolen by using a Faraday cage to store their keys. Faraday cages, or Faraday wallets, block the electronic signal. Mark Silvester, from the West Midlands Police crime reduction team, said: "To protect against this type of theft, owners can use an additional tested and Thatcham-approved steering lock to cover the entire steering wheel." The Mercedes-Benz has not been recovered following the theft, which happened in the Elmdon area of Solihull overnight on 24 September. With thanks to the West Midlands Police for the footage. Am I alone in missing the logic of the point made about faraday cages etc. How does this stop the car being stolen if it can be taken even if the keys are out of range ? Also, maybe these annoying keyless entry systems could be improved if Mercedes gave a means to switch the system OFF ! Faraday cages block the signal from transmitting completely so there is no signal to boost. I understand placing your keys in a good old metal tin box with a lid will work equally well. With my Mercedes GLC the key transmitter can be switched off by double-clicking the 'Lock' button on the key fob. In addition, I have removed the Start/Stop button from the dash, thus the car can only be started with the key in the ignition switch. Both the above are explained in the owner's handbook. I purchased a couple of faraday wallets off ebay for about 3 quid each, and they work. BTW, does the box the thieves use remember the frequency, so it will act like a key away from the original key in the house. That's how I would design it. I have an immobiliser and a tracker, but I suppose they are redundant if they can get to the key frequency.